A protocol for the extraction of a periplasmic transition metal chaperone in the context of its native binding partners, and biophysical characterization of its substrate contents by X-ray fluorescence and radiometal uptake is presented. Radka, C. D., Radford, L. L., Massicano, A. V., DeLucas, L. J., Lapi, S. E., Aller, S. G. Essential Metal Uptake in Gram-negative Bacteria: X-ray Fluorescence, Radioisotopes, and Cell Fractionation. J. Vis. Exp. (132), e57169, doi:10.3791/57169 (2018). We demonstrate a scalable method for the separation of the bacterial periplasm from the cytoplasm. This method is used to purify periplasmic protein for the purpose of biophysical characterization, and measure substrate transfer between periplasmic and cytoplasmic compartments. By carefully limiting the time that the periplasm is separated from the cytoplasm, the experimenter can extract the protein of interest and assay each compartment individually for substrate without carry-over contamination between compartments. The extracted protein from fractionation can then be further analyzed for three-dimensional structure determination or substrate-binding profiles. Alternatively, this method can be performed after incubation with a radiotracer to determine total percent uptake, as well as distribution of the tracer (and hence metal transport) across different bacterial compartments. Experimentation with a radiotracer can help differentiate between a physiological substrate and artefactual substrate, such as those caused by mismetallation. X-ray fluorescence can be used to discover the presence or absence of metal incorporation in a sample, as well as measure changes that may occur in metal incorporation as a product of growth conditions, purification conditions, and/or crystallization conditions. X-ray fluorescence also provides a relative measure of abundance for each metal, which can be used to determine the best metal energy absorption peak to use for anomalous X-ray scattering data collection. Radiometal uptake can be used as a method to validate the physiological nature of a substrate detected by X-ray fluorescence, as well as support the discovery of novel substrates. In gram-negative bacteria, cytoplasmic pools of transition metal atoms are increased and replenished by inner membrane ABC (ATP-binding cassette) importers that mitigate metal translocation across the inner membrane. Periplasmic Cluster A-1 substrate-binding proteins (SBPs) compose a group of chaperones that bind the metal atoms directly and ferry them through the periplasm to deliver them to cognate ABC importers1. Other Clusters of SBPs are dedicated to the transport of substrates, such as chelated metal (Cluster A-2), carbohydrates (Clusters B and D-1), and amino acids (Clusters B, C, F-2 and F-4); nevertheless, regardless of substrate, SBPs follow an evolutionarily-conserved c-clamp fold2. The generalized proposed mechanism for SBP substrate transfer includes the c-clamp undergoing a series of contortions that resemble a Venus flytrap3. Generally, Cluster A-1 SBPs purify in a holo (metal-bound) form, though study of these SBPs is limited by the difficulty in generating apo (metal-free) forms of protein for experimentation4. To date, strategies to study apo Cluster A-1 SBPs have been limited to mutagenesis, dialysis, and partial denaturation with ethylenediaminetetraacetic acid (EDTA) chelator5,6,7,8,9,10,11. Structural data originating from these experiments suggest that Cluster A-1 SBPs may not precisely follow the Venus flytrap mechanism. Currently missing from the literature is a method of producing apo Cluster A-1 SBPs in vivo using physiological binding partners. We demonstrate for the first time using cell fractionation to purify YfeA, a Cluster A-1 SBP from Yersinia pestis, the etiological agent of plague, which was converted to the apo form through interaction with its physiological cognate YfeBCDE ABC importer in the cell. We show YfeA is in the apo form by energy-dispersive X-ray spectroscopy (EDS), also known as X-ray fluorescence. We also demonstrate YfeBCDE functionality by combining cell fractionation with highly sensitive radioactive metal uptake studies to distinguish between metal uptake across the outer membrane and metal import across the inner membrane. The use of a radioactive tracer allows for the detection of pg/L quantities of metals, much lower than the limit of detection for techniques such as inductively coupled plasma mass spectrometry (ICP-MS) or atomic absorption spectroscopy (AAS). This allows for minimal perturbation of the system being studied. Additionally, the traditional methods listed often require larger sample volumes, additional post-processing, and longer turn-around times, which are not typical for radiotracer assays. Thus, using a radiotracer provides a convenient and straightforward method for monitoring metal distribution and uptake within a cell. It remains to be determined if an apo Cluster A-1 SBP produced using this method would echo the structural observations from the current practices used to generate apo protein. Cell fractionation is an established method for separating cellular compartments for the implicit purpose of specifically probing their contents in isolation12. Cell fractionation is commonly used to confirm the location of a molecule during the cell cycle or measure the activity of a particular compartment13. For example, metal transport activity can be assayed by probing cellular compartments for metal substrate. Integrating cell fractionation enables distinction and comparison between metal uptake across the outer membrane and metal transfer across the inner membrane. These processes can then in turn be measured over time. In the case of protein purification, the most common methods of cell lysis and separation of soluble components from insoluble components are mechanical disruption (i.e., grinding, blending), high pressure homogenization (i.e., French pressure cell press, cell disrupter), and ultrasonic frequencies (i.e., sonication)14. Use of ultrasonic frequencies to lyse cells is generally best suited for small volumes; however, sonication is known to generate excessive heat that can denature protein. To avoid generating excessive heat, ultrasonic frequencies are usually applied in sequential short bursts, which can be time consuming and inadvertently degrade DNA molecules into smaller fragments. Additionally, multiple expensive sonication probes may be required for preparative and analytical experiments, as each probe has a limited range for the sample volume that can be processed. Use of high pressure to lyse cells avoids generating excessive heat during cell lysis by chilling French pressure cell press components prior to lysis or operating a cell disruptor in a cold environment such as a cold room. Like sonication probes, multiple sets of French pressure cell press components may need to be purchased to process a wide range of sample volumes. French pressure cell press assemblies are easy to connect but awkward to operate and clean, can be heavy to move and are prone to clogging from dense samples. Advantages to using ultrasonic frequencies and high-pressure systems to lyse cells include high sample recovery, ability to process multiple samples with minimal cross contamination, and adjustable shearing force, which can be adapted for lysis optimization of a wide range of sample types. Optimization can occur by adjusting the ultrasonic frequency, duration of bursts, piston pressure pounds per square inch (psi), and number of passes through the press. Use of mechanical disruption to lyse cells may be the most technically trivial and least expensive strategy for cell lysis. Mechanical disruption can present challenges in sample recovery and is not ideal for processing multiple samples. Mechanical disruption is gentler to samples than high pressure or ultrasonic frequencies, but is not high throughput and is prone to inefficient lysis. A significant experimental limitation of mechanical disruption, high pressure homogenization, and ultrasonic frequencies, is the uncontrollable disruption of the entire cellular architecture such that after lysis, all aqueous cell components are mixed together. Furthermore, all cell compartments do not disrupt at the same time; therefore, contents of compartments that lyse early can be subject to ongoing disruptive forces longer than contents of compartments that lyse late. Cell fractionation allows for inexpensive, technically straightforward, efficient compartment-based separation of cell contents while avoiding the need for expensive equipment and sample exposure to harsh, disruptive forces. In the case of the SBP, imported substrate is reintroduced to potentially apo protein and regenerates holo protein during lysis, prior to downstream chromatography or other purification techniques. Inclusion of EDTA chelator during lysis presents an additional obstacle, where metal affinity as a first step of protein purification is not possible because EDTA will strip metal from the chromatography resin and prevent protein binding15. A simple and inexpensive solution is cell fractionation by osmotic shock, where differential centrifugation and common laboratory reagents enable the investigator to carefully extract sufficient protein for functional analysis. Osmotic shock fractionation utilizes a two-step change in osmotic pressure to separate cellular compartments. Firstly, a hypertonic buffer causes cells to crenate as water leaves each cell and secondly, a hypotonic buffer causes cells to swell as water re-enters each cell. By carefully controlling how long the cells swell, the outer membranes can be selectively lysed (due to buildup of osmotic pressure from the incoming water), thus emptying their contents into the buffer. Preservation of the inner membranes ensures that the cytoplasmic contents are retained in spheroplasts, and are easily separated from periplasmic contents by centrifugation. YfeA is a polyspecific SBP capable of binding iron, manganese, and zinc atoms16. The relative proportions of incorporated metal can be altered according to metal supplementation during growth, and assayed by X-ray fluorescence such as is available at Argonne National Laboratory's Advanced Photon Source16. X-ray fluorescence enables the investigator to quickly profile a broad assembly of metals without the need for large or diffraction quality crystals, and can even glean data from protein precipitate or proteinaceous solution. X-ray fluorescence can quickly reveal unexpected results such as, in this case, the primary YfeA substrate being zinc and not the documented physiological substrates iron or manganese16. If used before collecting X-ray scattering data, X-ray fluorescence can inform the investigator in experimental design, such as which metal energy edge(s) to use for anomalous X-ray scattering data collection. Just as useful as determining the relative abundance of a metal, X-ray fluorescence can also determine if a metal is absent in a sample, providing a rapid method of separating crystals containing apo protein from holo protein, and estimating metal signal strength without the need for time-consuming data processing. Upon identifying a sample with a strong metal signal, the precise wavelength to use for anomalous X-ray scattering data collection can be determined by multiple-wavelength anomalous dispersion (MAD) scan. This detailed protocol is intended to help new experimenters successfully perform cell fractionation and make effective usage of synchrotron beamline hardware to profile total metal content and advance the study of metal-binding proteins. In a 200 mL beveled flask, inoculate 30 mL of Luria Bertani broth (LB) with Escherichia coli strain BL21-CodonPlus (DE3)-RIPL cells containing pYFE3 plasmid16. Add 30 µL of 50 mg/mL ampicillin to the flask by aspirating with a pipette and 200 µL tip. Shake overnight at 225 rpm at 37 ˚C. NOTE: This is adapted from the Amresco manual. Prepare 6 L of liquid media by the following procedure. In a 2 L beveled flask, add 10.5 g of M9 minimal media to 1 L of ultra-pure H2O. Autoclave at 121 ˚C for 20 min and then cool to room temperature. Aseptically add the following sterile supplement solutions: 2 mL/L of 1 M MgSO4, 10 mL/L of 20% w/v glucose, 0.1 mL/L of 1 M CaCl2, and 1 mL/L of 50 mg/mL ampicillin. Perform this step in a biological safety cabinet to maintain a sterile environment. Warm the media to 37 ˚C. Add 5 mL/L of overnight starter culture to M9 minimal media by aspirating with an automated pipette and 5 mL tip. Shake the subculture continuously at 225 rpm at 37 ˚C for 9 h.
NOTE: During this step YfeABCDE is overexpressed by autoinduction from its native Y. pestis promoter. Recover cells by centrifugation at 4,500 x g for 30 min at 4 ˚C. Resuspend cells in 50 mL of an ice-cold phosphate buffer solution (20 mM Na2HPO4 pH 7.6, 50 mM NaCl) by aspirating with a pipette and 1 mL tip, and freeze overnight at -80 ˚C. Thaw the resuspension at 4 °C and pellet cells at 4,000 x g for 20 min at 4 ˚C. Resuspend cells in 50 mL of ice-cold high salt buffer (200 mM Tris-HCl pH 8.0, 400 mM NaCl, and 2 mM EDTA) by aspirating with an automated pipette and 25 mL tip. Incubate the suspension over ice for 20 min, with occasional inversion for mixing. Pellet the cells at 4,500 x g for 20 min at 4 ˚C. Resuspend the cells in 50 mL of ice-cold low salt buffer (10 mM Tris-HCl pH 8.0) by aspirating with an automated pipette and 25 mL tip. Incubate the suspension over ice for 20 min, with occasional inversion for mixing. Pellet the spheroplasts at 4,500 x g for 20 min at 4 ˚C. Recover the supernatant containing periplasm. Resuspend the pelleted spheroplasts in the phosphate buffered saline solution (Step 3.2) by aspirating with an automated pipette and 25 mL tip, and lyse cells by three cycles of French pressure cell press at 1500 psi. NOTE: A French pressure cell press can be awkward to operate and uses a hydraulic pump to drive cell lysis. Use caution when engaging the hydraulic pump, ensuring proper alignment of the piston with the press, and keeping hands free of the hydraulic pump. Pellet the cellular debris at 50,000 x g for 20 min at 4 ˚C. Recover the supernatant containing cytoplasm. If necessary, the outer and inner membranes can be further fractionated16. Immediately after fractionation, filter the periplasmic fraction using a 0.45 µm membrane unit. Use a Luer lock syringe filter for ease and rapid filtration. Equilibrate a 5 mL Q anion exchange column using 20 mM Tris pH 7.6, 0.05% w/v NaN3 loading buffer at a flowrate of 5 mL/min. Load the periplasmic filtrate onto the pre-equilibrated 5 mL Q anion exchange column using 20 mM Tris pH 7.6, 0.05% w/v NaN3 loading buffer at a flowrate of 2 mL/min. Continue to wash the 5 mL Q anion exchange column using 20 mM Tris pH 7.6, 0.05% w/v NaN3 loading buffer until a baseline reading of A280 is achieved at a flowrate of 5 mL/min. Elute the bound protein using 20 mM Tris pH 7.6, 0.05% w/v NaN3, 0 - 1 M NaCl by linear gradient over 10 column volumes at a flowrate of 5 mL/min. Combine fractions containing A280 peak. Apo YfeA elutes between 200 mM NaCl and 300 mM NaCl. Concentrate the eluate by centrifugal concentrator until the volume reaches ~5 mL. Equilibrate a Superdex 200 pg gel filtration column with 20 mM Bis-Tris pH 6.3, 50 mM NaCl, 0.05% w/v NaN3 gel filtration buffer at a flowrate of 2.5 mL/min. Load the concentrated anion exchange eluate onto the pre-equilibrated Superdex 200 pg gel filtration column and purify using gel filtration buffer from Step 5.5 at a flowrate of 2.5 mL/min. Combine fractions containing A280 peak corresponding to a ~30 kilodalton (kDa) protein. NOTE: The following reference is an example FPLC experiment to demonstrate the protocol17. Concentrate the gel filtration eluate by centrifugal concentrator to a final protein concentration of 22 mg/mL. Calculate the protein concentration by dividing the A280 reading by 1.276 mg/mL. This theoretical extinction coefficient was predicted by ExPASY ProtParam18. NOTE: An A280 sample reading of 5.104 AU corresponds to a 4.000 mg/mL solution; 5.104 AU ÷ 1.276 mg/mL = 4.00 mg/mL. Mix 1.5 µL of protein with 1.5 µL of 30% w/v PEG 4000, 50 mM NaCl, 20 mM Bis-Tris pH 6.3, 0.05% w/v NaN3 in sitting drop or hanging drop setup by aspirating with a pipette and 10 µL tip. Incubate crystallization drops at 293 K for 2 - 4 weeks. Flash-freeze crystals in liquid nitrogen pool for shipment to the synchrotron. Navigate to the Hutch tab. Use the Energy subheading to set energy to 10.0 keV. Navigate to the Scan tab. Navigate to the Interactive tab. Mount sample. Select the Optimize fluorescence signal. Input 4.00 s under the Time subheading. Select Take fluorescence spectrum. View the spectrum using Plot tab. Move the sample out of beam. Navigate to the Scan tab. Navigate to the Periodic Table tab. Select the K-edge of element of interest. NOTE: The energy value in Energy subheading is in eV. Navigate to the Hutch tab. Use the Energy subheading to set energy to value in Step 8.1 in keV. Move the sample into the beam. Navigate to the Scan tab. Navigate to the Auto tab. Input 2.00 s under the Time subheading. Select Start Scan. View the MAD Scan using the Plot tab. NOTE: The energy value in the Peak subheading is in eV rather than keV. Move the sample out of the beam. Navigate to the Hutch tab. Use the Energy subheading to set energy to value in Step 8.4 rounded up to the next eV (i.e., Peak: 9658.3 eV, set Energy to 9659 eV). Move the sample into the beam. Collect data set. Repeat Step 8.1 - 8.6 for all metals of interest. In a 14 mL culture tube, inoculate 5 mL of LB with E. coli strain BL21-CodonPlus (DE3)-RIPL cells containing pYFE3 plasmid16. Add 5 µL of 50 mg/mL ampicillin by aspirating with a pipette and 10 µL tip. Shake at 225 rpm at 37 ˚C for 7 h.
Pellet the cells at 15,000 x g for 1 min at room temperature using a tabletop centrifuge. Wash the cells in 1 mL of supplemented M9 minimal media by aspirating with a pipette and 1 mL tip. Repeat once. In a 50 mL conical tube, subculture cells into 30 mL supplemented M9 minimal media by aspirating with a pipette and 1 mL tip. Shake at 225 rpm at 37 ˚C for 9 h.
Determine the amount of radioactivity required to achieve approximately 100,000 counts per minute (cpm). NOTE: This will vary depending on the radioisotope and instrument used for detection. For example, a sample containing 7.4 kilobecquerel (kBq) (0.2 microcurie (µCi)) of 52Mn gives a reading of 550,000 cpm on an automated gamma detector (NaI). Thus, the amount of radioactivity needed to get a count of 100,000 cpm can be determined using the following equation: (100,000 cpm/550,000 cpm)*7.4 kBq (0.2 µCi) = 1.35 kBq (0.036 µCi). Caution: Radioactive decay results in the release of ionizing radiation, which is hazardous. When working with radioactivity always use the appropriate shielding and follow the principles of As Low As Reasonably Achievable (ALARA) by increasing distance and shielding while reducing exposure time. Only trained personnel should handle radioactivity in specially designated laboratories, which are licensed for the use of radioactive materials. Multiply the required radioactivity calculated in Step 9.4 by the total volume of subculture, to determine the total amount of radioactivity necessary. Add this amount (preferably in a small volume of 50 - 100 µL) to the tube containing the subculture so that there are 100,000 cpm/mL, and vortex well for 30 s.
NOTE: For 31 mL of subculture, the total amount of radioactivity required is 1.35 kBq (0.036 µCi) x 31 mL = 41.3 kBq (1.12 µCi). Aliquot 1 mL of the subculture (now containing radioactive tracer) into individual 1.5 mL centrifuge tubes by aspirating with a pipette and 1 mL tip, and place in a 37˚C thermomixer, with vortexing at 1 × g. Include enough tubes so that there are three replicates for each desired measurement as well as three additional replicates to use as standards (set the standards aside, do NOT perform the fractionation assay on the standards). NOTE: Assaying at 1, 2, and 4 h would require 12 tubes total. After incubation, centrifuge the tubes at 15,000 × g for 30 s using a benchtop centrifuge (preferably cooled to 4 ˚C) and discard the supernatants. Re-suspend the cells in 1 mL of ice cold, high salt buffer (Step 4.1) by aspirating with a pipette and 1 mL tip, and immediately place on ice for 20 min. Pellet the cells again at 15,000 × g for 30 s using a benchtop centrifuge (preferably cooled to 4 ˚C) and discard the supernatants. NOTE: The supernatant contains unassociated free metal. Re-suspend the cells in ice cold, low salt buffer (Step 4.2) by aspirating with a pipette and 1 mL tip, and incubate on ice for 20 min. NOTE: It is important to aspirate gently via pipette for this step. Pellet the cells at 15,000 × g for 30 s, and collect each of the supernatants into new 1.5 mL centrifuge tubes. There should now be six tubes per time point. NOTE: The supernatant contains the periplasmic fraction and the pellet contains the membranous and cytoplasmic fraction. We refer to the pellet as the cytoplasmic fraction. Measure the radioactivity in each fraction (six tubes per time point), as well as in the standards set aside in Step 9.6. Use the amount of radioactivity in the standards to determine the total amount of radioactivity originally added to every sample. To determine the percentage of radioactive uptake in the periplasm, use the following equation: (Average cpm of periplasmic fraction/average cpm of standards) x 100. To determine the percentage of radioactive uptake in the cytoplasm, use the following equation: (Average cpm of the cytoplasmic fraction/average cpm of the standards) x 100. To determine % total uptake, use the following equation: ((Average cpm of the periplasmic fraction + average cpm of the corresponding cytoplasmic fraction)/(average cpm of the standards)) x 100. SDS-PAGE gel and gel filtration chromatograms were collected to evaluate the quality of protein purification from preparative periplasm fractionation. The purification of holo YfeA has been previously described16; however, the purification of apo YfeA has not been reported. The strategy to purify apo YfeA described by this method uses a recombinant wild type construct that does not contain an affinity tag of any kind, particularly one that could be used for protein immunoblot (i.e., His-tag), and a monoclonal antibody that recognizes YfeA has not been described. Therefore, mass spectrometry analysis was utilized to verify the purification of YfeA. To purify YfeA by fractionation, it is recommended to use a linear elution gradient for anion exchange chromatography (Figure 1). The linear elution gradient significantly improves YfeA enrichment from making up approximately 8% of the periplasm fraction to 49% of the anion exchange product as calculated by densitometry (Figure 1C). This composition is improved to 61% by gel filtration, and the elution volume of the apo protein is identical to the elution volume of the holo protein (Figure 2). Mass spectrometry analysis verifies the purification of YfeA through detection of 92.5% of the YfeA amino acid sequence, 246 total YfeA polypeptide spectra, 24 unique peptides, and 50 unique polypeptide spectra. Alternatively, to contrast the linear gradient product with the product from a step gradient elution, YfeA was purified by anion exchange using a wash step of 50 mM NaCl followed by an elution step of 250 mM NaCl (Figure 1D). The step gradient marginally enriches YfeA from composing 17% of the periplasm fraction to 18% of the anion exchange product as calculated by densitometry. The step gradient elution also enriches a protein contaminant band that mass spectrometry identified as containing multiple E. coli SBPs of similar molecular weight. Due to resolution limits of the HiLoad 26/600 Superdex 200 pg, similarity in the molecular weights and structures of the contaminating SBPs, gel filtration marginally improved YfeA enrichment to 20% of the gel filtration product. Should a linear elution gradient be unattainable for anion exchange, it is recommended to explore multiple step washes in 25 - 50 mM NaCl increments to identify the concentration of NaCl required to remove these contaminants. Purified apo and holo YfeA crystallize in the same crystallization conditions, though images of apo and holo YfeA crystal morphologies show differences in crystal growth between apo and holo YfeA states (Figure 3). In addition to mass spectrometry verification, X-ray diffraction data (not shown) collected from crystals grown from protein purified by this method confirmed the purification and crystallization of YfeA. 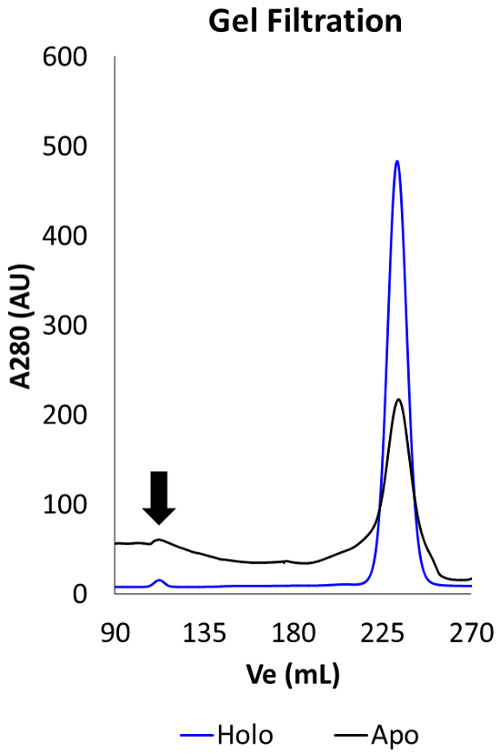 The extent of compartment contamination (cytoplasmic zinc reverting apo to holo protein in the periplasm fraction) can be assessed by capturing X-ray fluorescence spectra (Figure 4). 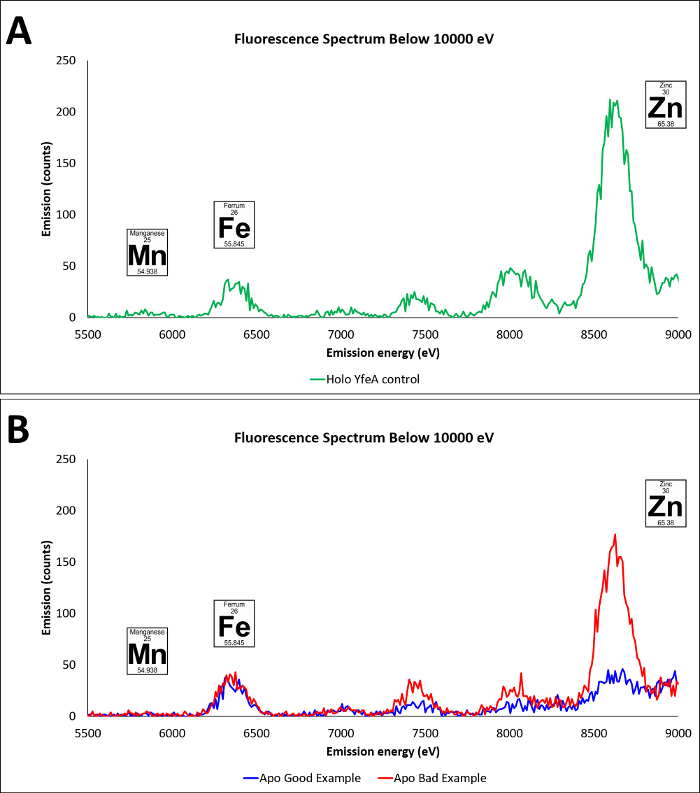 Given that zinc is the primary substrate bound to recombinant YfeA16, X-ray fluorescence spectra can rapidly differentiate between a YfeA sample containing a strong zinc signal commensurate with holo YfeA (Figure 4A), indicative of cross contamination, or a weak zinc signal suggestive of apo YfeA and minimal cross contamination (Figure 4B). ICP-MS analysis of the M9 minimal media confirmed transition metal levels are in the sub-micromolar range (not shown); therefore, detection of only minimal amounts of transition metals should be expected following a successful fractionation. Analytical fractionation (Figure 5) can be used to measure radiometal transport rates and capture functional data. A 60 minute snapshot comparing periplasmic and cytoplasmic fractions of E. coli cells expressing YfeA only, the full YfeABCDE transporter and none of the YfeABCDE components reveals the consequences of expressing a single recombinant protein or a protein complex on metal uptake (Figure 6). E. coli cells expressing no recombinant protein transported approximately half of the 52Mn added to the media to the cytoplasm with minimal retention in the periplasm. This negative control represents endogenous manganese transport. E. coli cells expressing recombinant YfeA transported approximately a quarter of the 52Mn added to the media to the cytoplasm with another quarter retained in the periplasm. Manganese retention in the periplasm and limited transport into the cytoplasm demonstrates the metabolic demand and bottleneck imposed by producing YfeA in the absence of the Yfe transporter. E. coli cells expressing recombinant YfeABCDE transporter transported nearly 100% of the 52Mn added to the media to the cytoplasm with minimal retention in the periplasm. Augmented manganese transport into the cytoplasm illustrates the contribution of the Yfe transporter in manganese transport. Figure 1. Purification of YfeA by fractionation. A. Hypothetical model for Yfe transporter. B. SDS-PAGE gel of YfeA purification from periplasm fraction, using linear gradient elution from anion exchange. SDS-PAGE gel shows the enrichment of YfeA (30 kDa) across purification steps. Black arrow denotes position of electrophoretic migration for YfeA. Molecular weight standards shown on right. (1) Periplasm fraction. (2) Q anion exchange column flow through. (3) Q anion exchange column peak elution. (4) Superdex 200 pg gel filtration column peak. C. YfeA enrichment – Good Example. Image processing of the SDS-PAGE gel from B calculates overall enrichment of YfeA by densitometry to increase from 8% of the periplasmic fraction to 61% of the gel filtration product. Blue boxes indicate YfeA/total signal used for densitometry calculations. Mass spectrometry analysis of the boxed band in lane 4 detected 259/280 YfeA amino acids, presented in green highlight. Amino acids present in the mature polypeptide are represented in bold capitalized black text, and amino acids composing the cleaved signal peptide are represented in italicized lowercase gray text. D. YfeA enrichment - Bad Example. SDS-PAGE gel of YfeA purification from periplasm fraction, using step gradient elution from anion exchange. 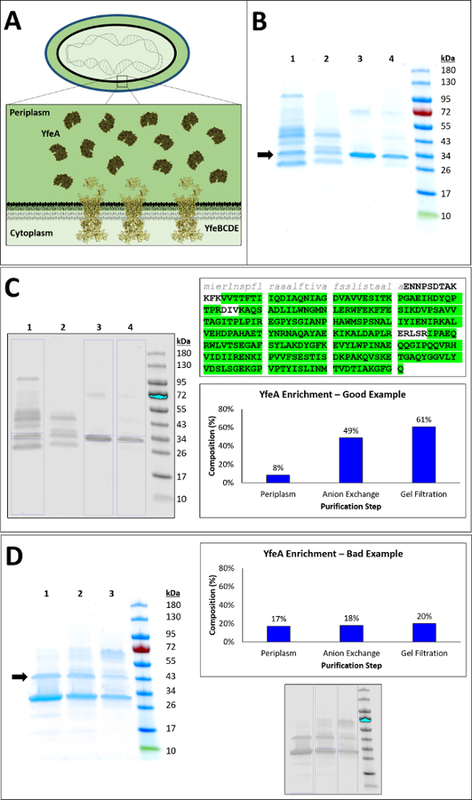 SDS-PAGE gel shows enrichment of YfeA across purification steps. Black arrow denotes position of electrophoretic migration of major protein contaminant enhanced during anion exchange chromatography. Molecular weight standards shown on right. (1) Superdex 200 pg gel filtration column peak. (2) Q anion exchange column 250 mM NaCl step gradient elution. (3) Periplasm fraction. Image processing of SDS-PAGE gel from D calculates marginal overall enrichment of YfeA by densitometry to a maximum of 20% of the gel filtration product. Blue boxes indicate YfeA/total signal used for densitometry calculations. Mass spectrometry analysis of the of the band denoted by black arrow in lane 1 detected 26 unique peptides of LivJ (39 kDa), 25 unique peptides of EfeO (41 kDa), and 17 unique peptides of LivK (39 kDa). All three contaminants are periplasmic E. coli SBPs. Please click here to view a larger version of this figure. Figure 2. Apo YfeA and holo YfeA gel filtration chromatograms. Black arrow denotes position of void volume. Gel filtration peaks for apo YfeA (black curve) and holo YfeA (blue curve) show both protein states elute at the same elution volume, indicating that apo YfeA purified from the periplasm fraction has a similar hydrodynamic radius as holo YfeA purified from total cellular content after French press. Figure 3. Apo YfeA and holo YfeA crystal morphologies. Holo YfeA crystallizes as a monolithic crystal, while apo YfeA generally produces twinned crystals in the same crystallization condition. Please click here to view a larger version of this figure. Figure 4. Apo YfeA and holo YfeA X-ray fluorescence spectra. A. X-ray fluorescence spectra of holo YfeA that has been purified from M9 minimal media with no additional transition metal supplementation, green curve. Characteristic peaks are labeled for manganese, iron, and zinc. B. X-ray fluorescence spectra from YfeA sample produced in the context of YfeBCDE. Characteristic peaks are labeled for manganese, iron, and zinc. Blue curve. X-ray fluorescence spectra of YfeA purified from the context of YfeBCDE and successful fractionation of the periplasm fraction with minimal contamination of cytoplasmic transition metals and/or holo YfeA protein. Red curve. X-ray fluorescence spectra of YfeA purified from the context of YfeBCDE with unsuccessful fractionation from excessive lysis and significant contamination of cytoplasmic transition metals and/or holo YfeA protein. Please click here to view a larger version of this figure. Figure 5. Generalized workflow for fractionation. Please click here to view a larger version of this figure. Figure 6. 60 min radioactive metal uptake fractionation data. Each experiment was performed three times, and error bars indicate standard deviation. Red bar. E. coli cells that do not contain the Yfe transporter transport approximately ~50% of the 52Mn into the cytoplasm after 60 minutes, and maintain low levels of periplasmic 52Mn. Blue bar. E. coli cells containing the Yfe transporter transport >90% of the 52Mn into the cytoplasm after 60 minutes and maintain low levels of periplasmic 52Mn. Green bar. E. coli cells that contain only YfeA transport approximately ~25% of the 52Mn into the cytoplasm and retain ~25% of the 52Mn in the periplasm after 60 minutes. The radiometal used in this work, 52Mn (t1/2 = 5.59 d), was produced at the UAB Cyclotron Facility (Birmingham, AL) by proton bombardment on a natural Cr target, and purified as previously reported19. Caution: 52Mn is a positron emitter (β+avg = 242 keV, 29.4%), and also emits several high energy gamma rays with high intensity (Eγ = 744.2, 935.5, 1434.0 keV; I = 90.0%, 94.5%, 100%). For these reasons, the experiment must be performed following the radiation protection principles of ALARA, as described above. All items designated as radioactive waste should be appropriately contained, clearly labeled, and discarded according to established procedures. Cell fractionation is a useful tool for specifically probing the contents of a cellular compartment, and can serve as a useful tool for extracting small molecules such as metal atoms, as well as macromolecules such as proteins. It is worth noting that cell fractionation is not an absolute technique and can be error prone without careful attention to mixing/resuspension, incubation temperature, and incubation time. Incomplete mixing can result in minimal membranous lysis and thus negligible fractionation, fractionation at room temperature can cause rapid lysis of both membranes resulting in contamination of the periplasmic fraction with cytoplasmic contents, and extended incubation times can also result in excessive lysis and thus fraction contamination. A reasonable compromise for achieving efficient and relatively complete outer membrane lysis (while preserving the inner membrane) is 20 minute incubation over ice in the hypotonic fractionation buffer. Another consideration is the method of extraction, where harsh extraction by shaking or vortex could compromise the quality of the extract such as causing protein aggregation. It is recommended to mix gently such as by spatula, inversion or aspirating by pipette to maintain high quality material for downstream analysis. Purification from preparative cell fractionation can occur with variable efficiencies as evidenced by Figure 1. 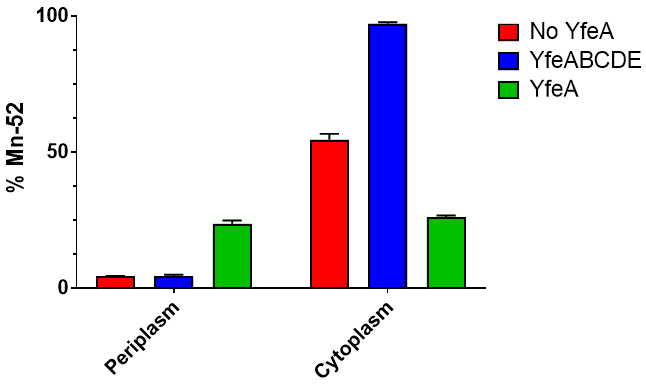 In one experiment, YfeA began as 8% of the extracted periplasmic content (Figure 1C), while in another experiment, YfeA began as 17% of the periplasmic content (Figure 1D). These differences can arise from several reasons such as variable expression conditions (adding EDTA to the growth media can increase expression of genes regulated by starvation mechanisms such as Fur regulation of the Yfe promoter), repeated use of frozen permanent stocks, and human error. Rather than adjusting the incubation times, it is recommended to scale-up the preparation. Purification from the periplasm fraction is recommended to include a linear gradient elution from the anion exchange chromatographic step. A step gradient elution is an elution strategy the uses discrete and abrupt changes in mobile phase composition (i.e., 0 mM NaCl, 50 mM NaCl, 150 mM NaCl, etc.). A linear gradient elution is an elution strategy that uses gradual change in mobile phase composition (i.e., 0 mM NaCl, 5 mM NaCl, 10 mM NaCl, etc.). A step gradient is useful for separating molecules that have different affinities for the stationary phase, and a linear gradient elution is useful for separating molecules that have similar affinities for the stationary phase. In the case of purifying protein with no artificial purification tag (to enhance affinity for the stationary phase) from a cell compartment that is rich in unique protein species, a linear gradient elution is recommended to separate proteins of noninterest that may have similar affinities to the stationary phase as the protein of interest. Generally, a yield of 1 - 2 mg of purified apo YfeA is expected from each liter of culture expressing YfeA from its endogenous Y. pestis promoter. X-ray fluorescence is a technique that enables the investigator to quickly determine metal content in a sample, and inform the investigator about unexpected metal incorporation that would otherwise be unknown. Although EDTA is included in the hypertonic fractionation buffer to remove loosely-associated or free metal, YfeA derived from the periplasm fraction can contain some holo protein. Given that metal transport is a dynamic process, perhaps the holo protein content originates from YfeA that has still not donated its cargo to YfeBCDE. It is worth noting that X-ray fluorescence only measures total metal content and does not indicate if metal is ordered in a crystal lattice, or specifically bound to a protein. To determine if metal is ordered in a crystal lattice and/or specifically bound to a protein molecule, X-ray scattering data collection and processing is required. Nevertheless, X-ray fluorescence allows for quick sample assessment of metal contamination and/or residual holo protein integration. Synchrotron radiation time is limited and there is not always time to devise a strategy for collecting X-ray scattering data on every sample, thus X-ray fluorescence is a valuable technique for screening many crystals and prioritizing for which samples X-ray scattering data should be collected. Furthermore, X-ray fluorescence enables data collection from samples that may not diffract X-rays. While collecting X-ray fluorescence data, at times the signal can be very weak and the resulting spectra uninformative. To improve the strength of the signal, either for X-ray fluorescence or MAD scanning, consider increasing the exposure time and/or decreasing the X-ray beam attenuation. When a sample is identified for collecting X-ray scattering data, it is recommended to collect X-ray scattering data on a different part of the sample than what was used for X-ray fluorescence and MAD scanning to minimize radiation damage, improve quality of the data collection, and minimize any potential for reduction of anomalous signal. Detection of radioactive tracers requires nanomolar quantities of material or less, and the use of these tracers as molecular tracking agents provides a simple and highly sensitive method of probing cellular processes. The radiometal assay outlined above can be used to determine total metal uptake, distribution across cellular compartments, as well as rates of uptake. 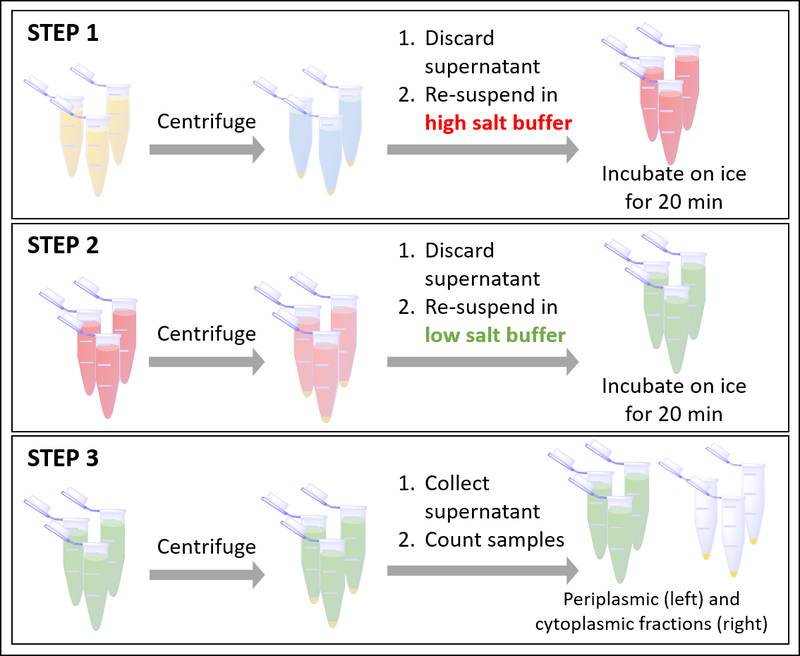 Indeed, each data time point requires a 40 minute fractionation; however, as each time point is reached, cells are immediately pelleted and incubated in high salt buffer (Figure 5, Step 1). Radiometal measurements of the media, discarded high salt buffer (Figure 5, Step 1), and periplasmic and cytoplasmic fractions after (Figure 5, Step 3) indicate the high salt buffer incubation successfully removes all remaining unassociated free metal that lingered following the initial centrifugation after reaching the time point. The initial centrifugation removes most (up to 80%) of the unassociated free metal, and the centrifugation after incubation in the high salt buffer also removes additional remaining unassociated free metal. Any lingering unassociated free metal is not expected to significantly influence metal transport during the 40 minute fractionation. The influence of the 40 minute fractionation on intracellular metal transport is another consideration for prudent data interpretation. Virtually the entire fractionation protocol occurs over ice, apart from the 30 second centrifugation between steps. Metal transport time course experiments have indicated that maintaining cells at 4 °C abrogates metal transport20,21,22; therefore, because the experiments occurs over ice, the 40 minute fractionation is not expected to significantly augment metal levels in the periplasm of cytoplasm and the metal levels are expected to be representative of the time points at which the cells were initially centrifugalized. Determination of relative uptake in different cellular compartments can help inform XFS data, corroborate the physiological nature of a substrate as well as enable the investigator to further probe the molecular details of a mechanism. For example, addition of genetic mutagenesis to radiometal uptake experiments provides a direct method to reinforce key functional residues or molecules involved in substrate transport. Advantages of radiometal uptake experiments and analyses include rapid turnaround, high throughput, high reproducibility, and parallelization of experiments comparing growth conditions and genetic constructs. Data were also collected at GM/CA@APS, which has been funded in whole or in part with federal funds from the National Cancer Institute (ACB-12002) and the National Institute of General Medical Sciences (AGM-12006). This research used resources of the Advanced Photon Source (APS), a U.S. Department of Energy (DOE) Office of Science User Facility operated for the DOE Office of Science by Argonne National Laboratory under Contract No. DE-AC02-06CH11357. Use of the Advanced Photon Source was supported by the U. S. Department of Energy, Office of Science, Office of Basic Energy Sciences, under Contract No. W-31-109-Eng-38. We would like to acknowledge the UAB Comprehensive Cancer Center - Mass Spectrometry/Proteomics Shared Facility (P30CA13148-38) for their assistance in mass spectrometry analysis. C.D.R. was supported by a grant from the University of Alabama at Birmingham Office of Diversity, Equity, and Inclusion. L.L.R. was supported by the Radiology Department of the University of Alabama at Birmingham. The Department of Energy, Office of Science, Isotope Program supported 52Mn production and A.V.F.M. under grant DESC0015773. ter Beek, J., Guskov, A., Slotboom, D. J. Structural diversity of ABC transporters. J Gen Physiol. 143, (4), 419-435 (2014). Berntsson, R. P., Smits, S. H., Schmitt, L., Slotboom, D. J., Poolman, B. A structural classification of substrate-binding proteins. FEBS Lett. 584, (12), 2606-2617 (2010). Mao, B., Pear, M. R., McCammon, J. A., Quiocho, F. A. Hinge-bending in L-arabinose-binding protein. The "Venus's-flytrap" model. J Biol Chem. 257, (3), 1131-1133 (1982). Hoeppner, A., et al. Proteins and Their Ligands: Their Importance and How to Crystallize Them. Advanced Topics on Crystal Growth. InTech. Rijeka, Croatia. (2013). Lee, Y. H., et al. The crystal structure of Zn(II)-free Treponema pallidum TroA, a periplasmic metal-binding protein, reveals a closed conformation. J Bacteriol. 184, (8), 2300-2304 (2002). Wei, B., Randich, A. M., Bhattacharyya-Pakrasi, M., Pakrasi, H. B., Smith, T. J. Possible regulatory role for the histidine-rich loop in the zinc transport protein, ZnuA. Biochemistry. 46, (30), 8734-8743 (2007). Yatsunyk, L. A., et al. Structure and metal binding properties of ZnuA, a periplasmic zinc transporter from Escherichia coli. J Biol Inorg Chem. 13, (2), 271-288 (2008). McDevitt, C. A., et al. A molecular mechanism for bacterial susceptibility to zinc. PLoS Pathog. 7, (11), e1002357 (2011). Couñago, R. M., et al. Imperfect coordination chemistry facilitates metal ion release in the Psa permease. Nat Chem Biol. 10, (1), 35-41 (2014). Abate, F., et al. Apo, Zn2+-bound and Mn2+-bound structures reveal ligand-binding properties of SitA from the pathogen Staphylococcus pseudintermedius. Biosci Rep. 34, (6), e00154 (2014). Ahuja, S., et al. Structural analysis of bacterial ABC transporter inhibition by an antibody fragment. Structure. 23, (4), 713-723 (2015). Alberts, B., et al. Fractionation of Cells. Molecular Biology of the Cell. 4th edition, Garland Science. New York, NY. (2002). Zhao, H., Martinis, S. A. Isolation of bacterial compartments to track movement of protein synthesis factors. Methods. 113, 120-126 (2017). Brown, R. B., Audet, J. Current techniques for single-cell lysis. J R Soc Interface. 5, S131-S138 (2008). Bornhorst, J. A., Falke, J. J. Purification of proteins using polyhistidine affinity tags. Methods Enzymol. 326, 245-254 (2000). Radka, C. D., et al. Crystal structure of Yersinia pestis virulence factor YfeA reveals two polyspecific metal-binding sites. Acta Crystallogr D Struct Biol. 73, (7), 557-572 (2017). Elgundi, Z., Sifniotis, V., Reslan, M., Cruz, E., Kayser, V. Laboratory Scale Production and Purification of a Therapeutic Antibody. J Vis Exp. (119), e55153 (2017). Gasteiger, E., et al. Protein Identification and Analysis Tools on the ExPASy Server. The Proteomics Protocols Handbook. Walker, J. N. Humana Press. 571-607 (2005). Wooten, A. L., Aweda, T. A., Lewis, B. C., Gross, R. B., Lapi, S. E. Biodistribution and PET Imaging of pharmacokinetics of manganese in mice using Manganese-52. PLoS One. 12, (3), e0174351 (2017). Inman, R. S., Wessling-Resnick, M. Characterization of transferrin-independent iron transport in K562 cells. Unique properties provide evidence for multiple pathways of iron uptake. J Biol Chem. 268, (12), 8521-8528 (1993). Makui, H., et al. Identification of the Escherichia coli K-12 Nramp orthologue (MntH) as a selective divalent metal ion transporter. Mol Microbiol. 35, (5), 1065-1078 (2000). Forbes, J. R., Gros, P. Iron, manganese, and cobalt transport by Nramp1 (Slc11a1) and Nramp2 (Slc11a2) expressed at the plasma membrane. Blood. 102, (5), 1884-1892 (2003).